Continuing its commitment to raising money for Riley Hospital for Children, Westfield High School recently held its third Dance Marathon. The annual event is part of the national Miracle Network Dance Marathon that has raised more than $250 for Children’s Miracle Network Hospitals since 1991. In Indiana, high school Dance Marathons benefit a nearby college, which combines funds to donate to Riley. WHS’ marathon is a partnership with IUPUI. This year, the marathon was Feb. 15 and netted $88,158.62 from 1,122 donors, nearly double the number of donors from last year’s event. WHS Dance Marathon President and senior Abi Gift said the difference was the way students raised money — primarily by encouraging donations during the actual marathon. “This year, we really worked on engaging our participants while they were actually at our event,” Gift said. “This event, we were working more with them on fundraising during the event and reminding them it was a fundraiser, and even though they were there to have fun and have a great time, it was also to raise money for (Riley). Innovations included a game where Riley patients tagged event participants, who were then required to stay in “jail” for five minutes, or until they texted or called someone and received a donation. To get out of jail, they also had to ask at least one person for a donation. “It was a fun way to get the Riley kids involved and have participants more involved in something,” Gift said. The first year, WHS Dance Marathon raised just more than $36,000. It more than doubled the figure in 2018 with $73,325.41. Gift said the event is mutually beneficial for student organizers and pediatric hospital patients. More than 325 students were involved in putting on the Dance Marathon. 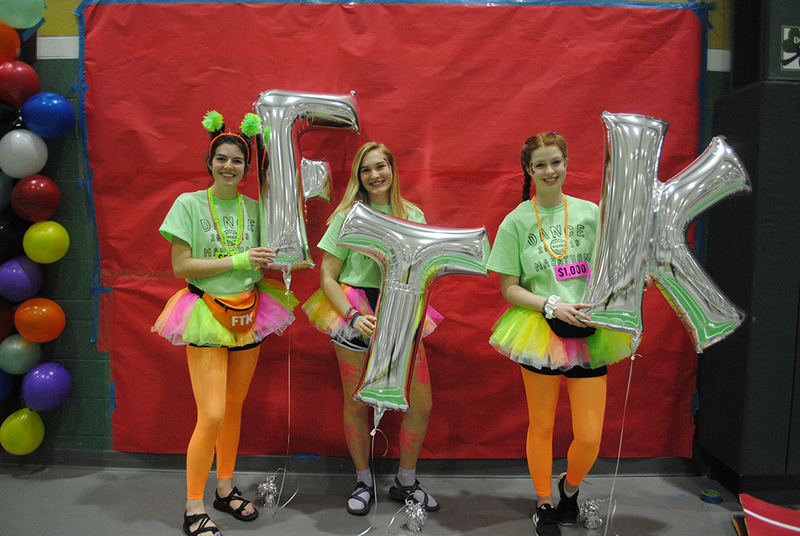 In its first year, WHS Dance Marathon sought input from Carmel High School, whose well-known Dance Marathon is affiliated with Indiana University. Topics included how to add security through the use of police officers and what activities to offer. Although it’s still fairly new, the WHS Dance Marathon seems to be keeping pace with CHS compared to where CHS Dance Marathon was when it launched 14 years ago. In 2005, CHS raised $35,411.49, a bit less than WHS’s first year. But CHS’s fundraising has exploded since then. IU Dance Marathon’s website states CHS has the largest fundraising high school Dance Marathon in the nation. At its 2018 event, CHS raised $453,395.06. WHS faculty advisor Sarah Gibbs sees the possibility of Westfield’s Dance Marathon fundraising eventually rivaling Carmel’s. “I believe we have great potential to grow like Carmel has over time. There is an incredible amount of generosity in our community,” she said. WHS Dance Marathon continues to grow in terms of dollars raised, student involvement and donor turnout. Next year, Gibbs said she hopes to find a group of students as passionate as this year’s team.